It seems like people really want toymakers Mattel and Hasbro to get together. Shares of Mattel (MAT) soared 10% Tuesday on no news. The stock only gave up a little bit of those gains Wednesday, falling about 2%. Hasbro (HAS) rose 4% Tuesday and another 2% Wednesday. Investors have dreamed about a possible merger between the two companies since November, following a story in the Wall Street Journal that said Hasbro was going to make a bid. 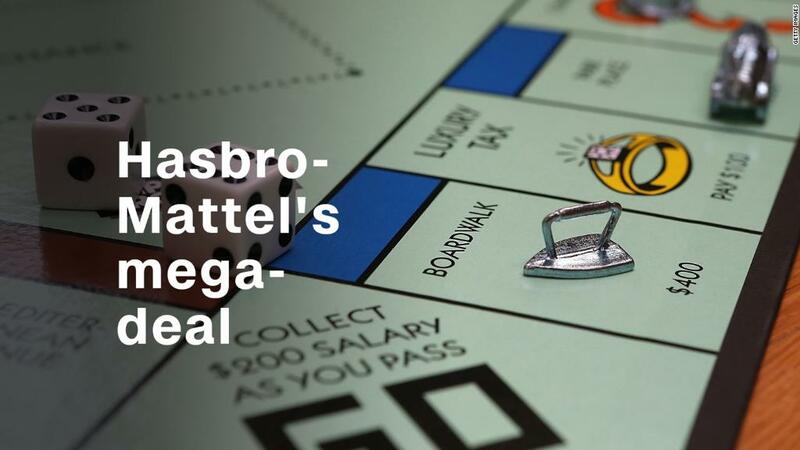 Reuters later reported that Mattel turned Hasbro's offer down. A spokesperson for Mattel told CNNMoney Tuesday that the company had no comment on the new speculation. Hasbro did not get back to CNNMoney. A marriage of the two companies could make sense. It would unite Hasbro, the owner of Mr. Potato Head, Monopoly, Tonka, My Little Pony and most Disney (DIS) toy licenses, with Mattel, the parent of Fisher-Price, Thomas and Friends, Barbie and Hot Wheels. The companies may be running out of time to prove to Wall Street that they are better off on their own. Even though Hasbro has done better than Mattel lately, Wall Street is concerned that plans by bankrupt Toys "R" Us to close more than 180 U.S. stores will hurt both toymakers. Each warned late last year that holiday sales would miss analysts' expectations. Hasbro's earnings and sales growth are likely to slow this year too, while Wall Street is forecasting a drop in revenue for Mattel in 2018. Investors are also nervous about possible price cuts for toys due to growing dominance of Walmart (WMT) and Amazon (AMZN) in the retail world. And many kids are now playing more video games on consoles, smartphones and tablets instead of playing with toys. Mattel will report its fourth-quarter results on February 1. Investors will be looking for any signs that new CEO Margo Georgiadis, formerly an executive at Google (GOOGL), will be able to turn around the company with a greater focus on high-tech toys. Hasbro is expected to report its holiday sales and profits sometime during the first week of February as well. And both companies will be showcasing new toys that they hope will be big hits this Christmas at the big Toy Fair in New York later in February. To go it alone, both companies will need to wow investors with their latest results, not to mention children of all ages (and their parents) with their new toys.